Get in touch with nature at Discovery Cove and Disney's Animal Kingdom. There's more to do: make an unforgettable trip to Happily Ever After Fireworks and explore the world behind art at Charles Hosmer Morse Museum of American Art. To see other places to visit, more things to do, and more tourist information, read our Orlando trip planner . Fort Wayne to Orlando is an approximately 5-hour flight. You can also do a combination of flight and train; or drive. Traveling from Fort Wayne in July, expect Orlando to be somewhat warmer, temps between 91°F and 75°F. Finish up your sightseeing early on the 25th (Thu) so you can travel to Miami Beach. Give yourself a bit of retail therapy at Lincoln Road and Aventura Mall. Get a sense of the local culture at Collins Avenue and Ocean Drive. Change things up with a short trip to Shark Valley in Everglades National Park (about 1h 10 min away). 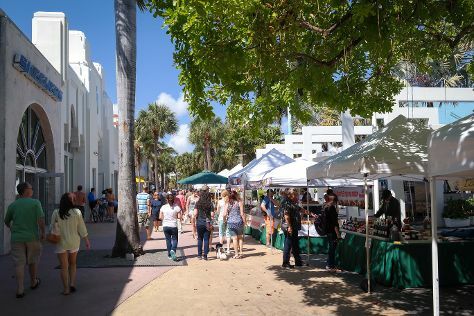 And it doesn't end there: enjoy the sand and surf at South Beach, browse the different shops at Bayside Marketplace, take in the pleasant sights at Espanola Way, and appreciate the extensive heritage of Art Deco Historic District. To see ratings, where to stay, more things to do, and more tourist information, read Miami Beach road trip website . Traveling by flight from Orlando to Miami Beach takes 3.5 hours. Alternatively, you can drive; or do a combination of flight and bus. In July, daytime highs in Miami Beach are 91°F, while nighttime lows are 78°F. Finish up your sightseeing early on the 28th (Sun) so you can go by car to Islamorada. On the 29th (Mon), view the masterpieces at Lobster Trap Art Gallery, then get a taste of the local shopping with Old Road Gallery, then identify plant and animal life at Florida Keys Wild Bird Rehabilitation Center, and finally discover the deep blue sea with a scuba or snorkeling tour. Here are some ideas for day two: identify plant and animal life at Dolphin Research Center, then fly like a bird with a parasailing or paragliding tour, and then see what you can catch with a fishing tour. To find where to stay, more things to do, other places to visit, and more tourist information, refer to the Islamorada online trip itinerary planner . Drive from Miami Beach to Islamorada in 2 hours. Alternatively, you can take a bus. In July, plan for daily highs up to 92°F, and evening lows to 81°F. Finish up your sightseeing early on the 30th (Tue) so you can go by car to Big Pine Key. Big Pine Key is a census-designated place and unincorporated community in Monroe County, Florida, United States, on an island of the same name in the Florida Keys. Start off your visit on the 31st (Wed): shop like a local with Artists in Paradise Gallery, look for all kinds of wild species at National Key Deer Refuge, and then enjoy the sand and surf at Bahia Honda State Park. Plan trip to Big Pine Key with our itinerary maker to find out where to go and what to do. Traveling by car from Islamorada to Big Pine Key takes 1.5 hours. Alternatively, you can take a bus. In July, daytime highs in Big Pine Key are 92°F, while nighttime lows are 81°F. Finish up your sightseeing early on the 31st (Wed) so you can catcht the bus to Key West. Get outdoors at Key West Butterfly & Nature Conservatory and Fishing Charters & Tours. Head to Alan S. Maltz Gallery and Collections Key Westfor plenty of shopping. There's lots more to do: see the interesting displays at The Ernest Hemingway Home and Museum, contemplate the long history of Truman Little White House, fly like a bird with a parasailing or paragliding tour, and see majestic marine mammals with a dolphin and whale watching tour. To see other places to visit, photos, more things to do, and other tourist information, you can read our Key West trip site . Traveling by bus from Big Pine Key to Key West takes an hour. Alternatively, you can drive. In July, daytime highs in Key West are 89°F, while nighttime lows are 81°F. Wrap up your sightseeing on the 3rd (Sat) early enough to travel back home.